I recently reviewed the Nike Air Max Sequent 2. It’s a modified version of the Air Max Sequent. Since it’s a common thing to find new interesting features on any modified version, I was quite sure there would be new things to talk about in the Air Max Sequent 3. So, that’s why I decided to give it a go. 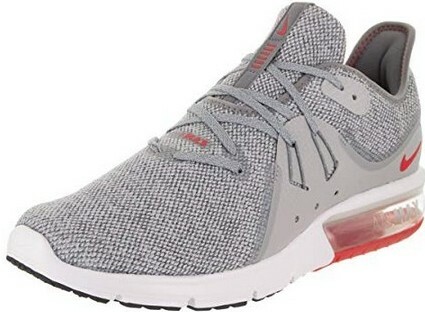 If you’ve used the previous model of Air Max Sequent line of shoes, you would know they usually come with very responsive air unit in the heel. You may also know how lightweight and comfortable the shoes are. It’s good you have those knowledge. This new model has some distinctive features that add to the comfort, providing wearers a very secure and snug fit. Find out more about Air Max Sequent 3 below. I have spent some hours reading reviews and watching review videos of the Nike Air Max Sequent 3 and gathered some helpful opinions, both positive and negative. As I can’t keep them to myself, I decided to highlight them below. 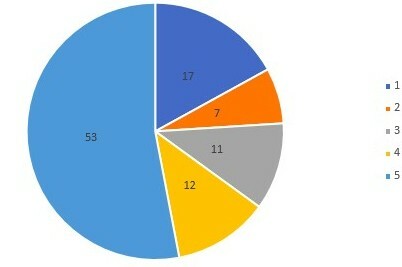 I always try my best to present customer rating in a pie chart in any of my review. Therefore, this one won’t be different. I hope you would find the data in the chart helpful. The data are in percentage and the rating ranges from 1 to 5 star. I have decided to add a video showing some features of Nike Air Max Sequent 3 which you may find interesting and helpful. The guy in the video did a quick introduction to some features of the shoe. He quickly talked about the upper and then went on to talk about the lace and its function. He talked a bit about the interior and moved on to show the Max Air unit in the heel. Finally, he showed the outsole and quickly gave some brief info. 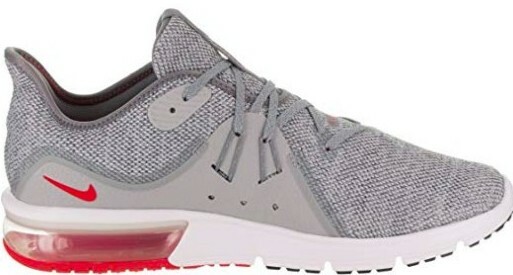 The Air Max Sequent 3 is now a popular shoe among Air Max Sequent line of shoes. The breathable and excellent flexible material upper make the shoe wraps around your feet, providing snug fit. The midsole is another feature that makes the shoe more functional and let’s not forget about the U-shape Air Max unit that creates responsive effect and absorbing impact shock. It’s worth noting that there are some reviewers that complain about the air unit being inflated and not happy about the overall quality of the shoe, but these reviewers are few compared to the number of reviewers that appreciate it. Many people are very happy that Air Max Sequent 3 is very affordable. If you wish to buy Air Max Sequent 3, click any of the arrows above. It will redirect you to the seller. The upper, midsole, and outsole of a shoe are the may features that define it. The upper is the parts of a shoe that cover the back of the heel, the instep and the toes. Basically, the upper is attached to the sole of a shoe. The midsole is the middle layer of a sole. It’s the layer between the inner and outer sole of a shoe. Outsole is the bottom-most part of a shoe that makes direct contact with the ground and ensures surface gripping. It can be leather or rubber. The upper is made from a stretchy and flexible material called stretch-knit fabric. You know how socks feel like when you wear them – they are so lightweight, stretchy and flexible. That’s what the upper feels like on your foot when you put the shoe on. It does not only offer comfortable, lightweight feel but also give a chance for some air to keep the shoe interior in a good condition. Unlike the previous model, Air Max Sequent 3 has a synthetic overlay on the midfoot exterior. The purpose of the synthetic overlay is to ensure the foot is kept in place. The overlay has flywire cables attached to it. the flywire cables form two holes on each side. These stretchy wires enable wearers to customize the fit with the lace. Another thing that is distinctive about the shoe is its partial booties construction which helps enable smooth feeling while wearing it. This construction prevents the heel, ankles, and instep from hot spots or skin irritation. You would also find a molded foam which acts as a counter in the heel section. The purpose of this is to keep the foot in place and avoiding indeliberate slip off. Nike Air Max Sequent 3 features a U-shaped Nike Air Max unit in the heel. The purpose of the Max Air unit is to provide special cushioning, making you feel as if you’re working on air while standing on it. The Air Max unit is very responsive and function well for impact shock absorption. Phylon is usually a very responsive, flexible shock absorbing material that is mostly used in sport shoes. The material runs the length of Nike Air Max Sequent 3. It gives wearers the feel of lightweight shoe. The outsole of Air Max Sequent 3 still sticks to its root. It has the same outsole as its predecessors. The rubber outsole ensure good traction and durability. With the right thickness, it can protect the midsole foam from wear and tear. Another distinctive feature is the flex grooves along the forefoot. They allow your foot to flex naturally. They also render the foot lightweight. The Air Max technology was first featured in Nike footwear in the 70s. People could only feel the comfort of the air. Nike Air Max 1 was the first Air Max shoe to feature visible Air-Sole unit in the heel. When Air Max 1 was debuted with the visible air unit in 1987, it was something new for fans. The fans couldn’t only feel the comfort of the air, but they could also see it. in 1990 (three years later), the Air Max 90 was released featuring larger visible air window. Over the years, Nike has released Air Max shoes in different designs and variety of colourways. The shoes are popular among athletes, pop stars, sneakerheads, and so on. The Air Max shoes are still among the popular Nike shoes out there. first of all… I need to commend you on yhis lovely writeup. The reviews listed here are well arranged . the nike air max is undoubtedly the best of all in market nowadays. although i learnt from the negativity highlighted above but i had only experienced few ever since i started using the product in the past years. i appreciate the writer for throwing more light to this. I’m a big fan of NIke, and their Air Max Sequent. I actually think that the sequent is one of Nike’s best shoes. I currently have the Air Max Sequent 2’s, but have been doing research on the Sequent 3’s. Do you notice a big difference between the two models? There’s no question the 2’s are one of the most comfortable shoes I’ve ever had. Do you currently wear the Sequents? Thanks for posting the video for the shoes as well. I definitely noticed a few enhanced features when compared to Nike’s Sequent 2. It looks like they might even be more comfortable than the 2’s? Thank you for this thorough and balance expressions of thoughts and findings on the Nike Air max sequent brand. As i surfed though the site, i observed you’ve equally done same with sequent 2. I am new on the site and the few moments i have spent has been truly worth it. That phylon runs the entire length of sequent 3’s midsole thrills me. I’ve read through other other reviews too, and i believe the pros far outweighs the cons anyone might see. Thanks once again, i have learnt something new and might just be up for this on my next shopping. Hope to come around some other time. I will be glad to see you next next time. Let me know if you have any question. I will be glad to help. Nice looking shoes and very nicely detailed review. I always likes Nike shoes although where I live were a bit more expensive than what I would like. But I guess that some of the cost is because of the brand and that is natural. I will bookmark your site in case I will need some opinions in the future. Thanks for the comment Stratos. Just let me know if you need any help. Also, let me know if you have any trainers in mind that you would like me to review. Thanks for a great review. I was not aware of the specific shoe, so a review is great. I don’t own it, so I can’t offer an opinion on the shoe or any of its predecessors. I will have it in mind though for future purchases. Would you recommend this model or one of its predecessors? Why? I would definitely recommend the Air Max Sequent 3 for everyday wear and some light training. Right now, I prefer the Sequent 2. It depends on which style you think would suit you best. My next post will be on the Nike Air Max Sequent 4 – the sequent 4 may be somehow better. Great review! I am a fan of Nike shoes, clothes, socks, hats, and everything that comes from this company. Air Max in all versions, colors, and shapes are my Top shoes. There is no other like a good pair of Nike’s Air Max. I feel like my Air Max Versatile Blue are about to be retired, I can hear a new queen coming haha! Thanks again for the review. I like your review.I am curious about this one because it does seem to have some great features.I am a Saucony fan but maybe it is time to try something new.Thanks for the great review. This is a good review – I see you say that the quality is not good for running or other training – can you expand on that point please? I train 3 times per week usually 5km each time so I’m not sure if these will work – any thoughts or alternative suggestions? There are some reviewers that complained about the air pocket being inflated after few months. Overall, there are many reviewers that are happy with the quality of the shoe when used for running and other training. I won’t say it’s not a good shoe for running. That’s what’s it’s made for in the first place. I will buy this shoe just because of its comfort and style – it’s really a good looking shoe. And I will definitely use it for few miles run.